We leave Jerusalem after Morning Prayer and Breakfast, and take the opposite pilgrim’s route traveling from the Holy City to Jericho. 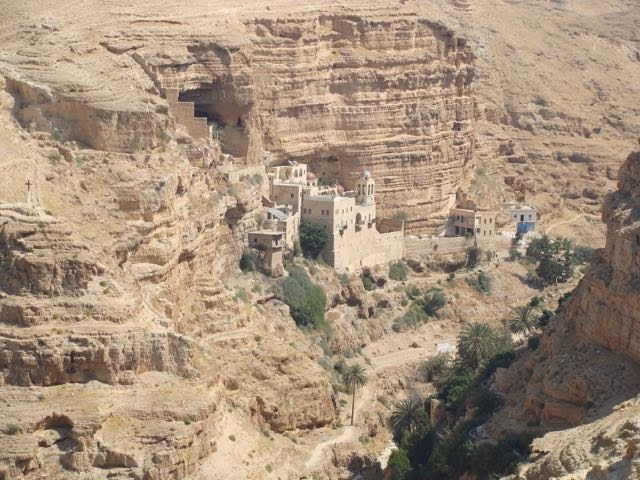 There are some stops along the way, such as an overview of the Monastery of Saint George in the Judean Desert. There is no electricity, no cable car, no roadway (that I can see) – these monks are truly at a remove. I wonder why it sounds so attractive? They have survived Persians, Ottomans, and now Israeli’s – more power to them. 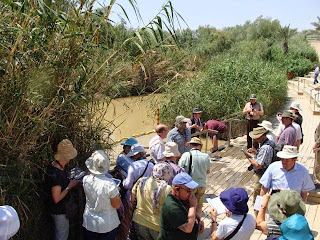 We stop at the Jordan River for renewal of Baptismal Vows. 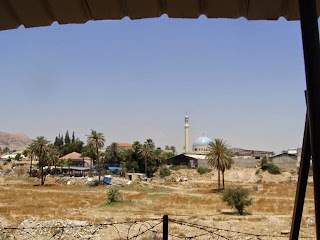 The Country of Jordan is just feet away, and on the other side of the river soldiers sit guard over their place for baptismal renewal. 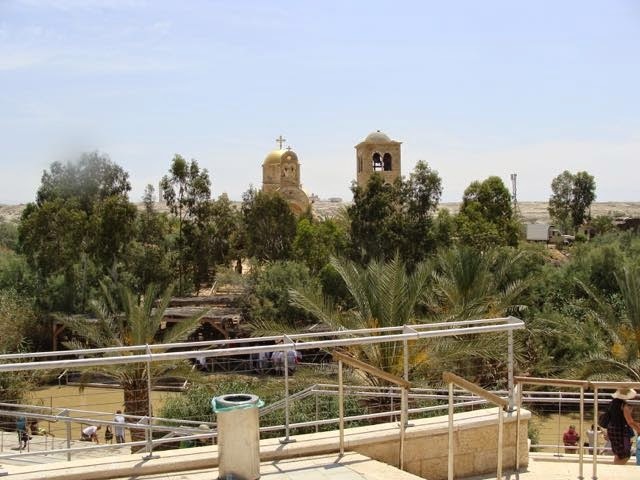 The Jordanian government has given land to various ecclesial groups to build churches there, and one can see them just beyond the greenery that lines a very muddy Jordan River. Perhaps it is commerce that will bring warring peoples together, or, more likely, that is what is keeping them apart. There are lots of tourists on the Jordan side, some wearing white robes, preparing to be baptized. On the Israeli side, actually on the Palestinian side, one can buy a cold drink, an olive wood cross, a Bible, a bikini, and a white baptismal robe all at the same store. As I sit and drink something cold, white doves come to see if I am going to drop a tidbit or two. I look at them, and I try to look through them to the symbol that they are. Jericho is a poor city, but lush with agriculture, especially dates and citrus. We stop for lunch at a restaurant in the shadow of a mosque, and so we are treated to the sermon from the mosque via loudspeaker. I wonder what is being preached. I ask around, “Has anyone ever read or listened to a Muslim sermon?” “No,” is the answer. Perhaps we should. We move on to visit the Sycamore Tree (Zachaeus). Such futile grasping at a specious reality but missing the point and the mystery frustrate me. It doesn't stop here, however. The next stop is to gaze at the Mount of Temptation – same emotions. What I would really like to have seen again is the tell at Jericho, the site of Katherine Kenyon’s trailblazing work, but we drive by. At least the guide mentions it, but we cannot see it. 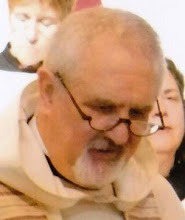 This is the danger of a “pilgrimage”. Everything must be ostensibly “holy”. Things that are indeed holy to me because they are the context of the mystery of faith and human existence are apparently outside of the box. The trip up is interesting. The West Bank is under Palestinian Control (although the road that we are traveling on is not!) There is an effort to expand agriculture in these areas. Forty years ago when I was here there was nothing here but mud brick refugee camps. Perhaps a level of progress is being made. The change at the border is startling, however. At the checkpoint, two “officials” (or were they soldiers) enter, one just checking us out, and the other holding an Uzi. It is very effective. The Israeli side is remarkably different: shopping centers, community centers, good roads, even more agriculture (dates, bananas, mangos, and avocados). 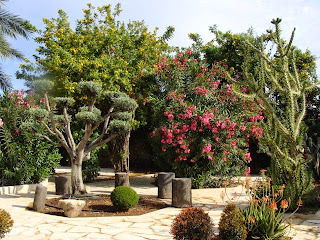 Last here, I went up to Kibbutz Lavi, above Tiberius. Those people had made the desert bloom – it was outstanding. That tradition seems to continue in Israel. It is quite lush. Now if they can just share that talent with their Palestinian neighbors. Again, entering Tiberius, we could have had the opportunity to stop by a first century synagogue with a marvelous mosaic floor with the signs of the zodiac. That however, is a different kind of holiness. Day Three - A new world and yet, not so much.